In 2015, VR Transpoint posted good results despite challenging market conditions. All business operation units remained profitable. Weak economic growth challenged us to renew our operations. VR Transpoint provides national and international logistics services on railways and on the road. Their strength is the possibility of flexibly combining train and car transports. Transports can also be complemented with services that provide added value, such as planning or storage. In 2015, the developments in the economy and the conditions in Finland's industry, the situation in Russia and the weakened rouble, as well as the global market prices of raw materials could be seen in the demand for logistics services. The challenging market conditions could be seen in VR Transpoint’s transport amounts and flows in Finland and in Eastern traffic. Despite a downturn in turnover, the net sales level remained good. VR Transpoint secured its profit-making ability by adjusting its operations and focusing on finding new opportunities for growth. All business operation units remained profitable. There were positive developments in the indicators for efficiency, quality and safety. Customer satisfaction also remained at a good level, even though there was a slight decrease. VR Transpoint received an overall rating of 3.9 on a scale of one to five. In the summer, there were changes in the corporate structure of Transpoint International, a provider of international road logistics, when its subsidiary in Hungary was sold. 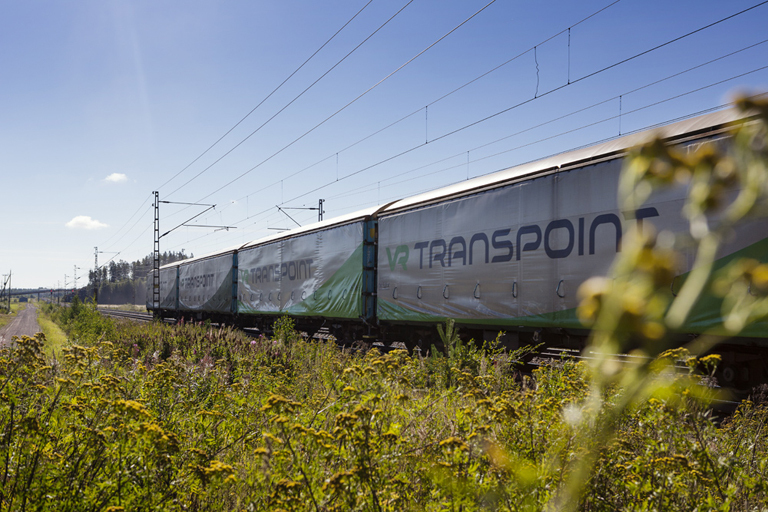 Transpoint International’s volumes grew in the Baltic and Eastern Europe, but decreased in Russia. As a result of this, its operations were adjusted in Kotka and Viipuri. Market conditions led to the loss of certain transport flows and volumes in rail logistics. VR Transpoint reacted quickly to any changes in demand, which ensured profitability. Increased operational efficiency could be seen in the growth of train sizes and in the increased share of electric traction. Railway yards prepared the implementation of new technologies such as tablet computers. The economic situation and the lull in the construction market also affected the Finnish road logistics market. The number of equipment was adjusted to better reflect demand. During the year, new investments were also made: transport equipment was renewed and work began on the construction of the Riihimäki terminal. The focus on improving the work community could be seen in the personnel survey as improved results. VR Transpoint updated its strategy for 2016–2020. It will seek growth from new lines of business, new industrial projects, Eastern traffic and wider logistics solutions. The strategy emphasises customer partnerships and committing to measurable service promises. In the near future, the development of its business operations will be affected by overall economic developments in Finland and in Russia as well as by ever increasing competition in the Finnish market and in Eastern traffic. The competition in freight traffic can be seen not only in the increased amount of actors in the field, but also between different forms of transport and transport routes. In these changing market conditions, VR Transpoint will focus on continuously developing its own operations while also listening to its customers. VR Transpoint emphasises a customer-oriented approach, efficiency and operational reliability, as well as environmental friendliness. It has increased the share of energy-efficient electric traction on railways, and in addition VR Transpoint has started a development project for introducing completely carbon neutral transports.